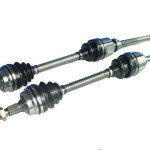 A drive shaft, also know as a driving shaft, propeller shaft, prop shaft, or cardan shaft transmits power from the transmission clutch and the gearbox to the wheels. Splines on the front end of the drive-shaft shaft slide in and out of the gearbox as the distance changes. Universal joints, jaw couplings, or rag joints at each end of the driveshaft allow the propeller shaft to be flexible, while constantly transmitting power. A Four Wheel Drive vehicle may have two drive shafts. Common symptoms of a failing driveshaft are; clunking noise when you accelerate or shift between drive and reverse, vibration when driving, squeaking noise while driving.